Film: The older Ethan Hawke gets, the better I think he gets. He went from potentially a pretty boy Diet Coke version of Brad Pitt early in his career to an angry, arse-kicking, flat-top sporting type who borders between sketchy as hell, to being the guy who could snap and beat your face in if you look at him the wrong way. He’s like a young Charles Bronson but with acting abilities. I picked up this film not just due to his presence in it, or Emma Watson or David Thewlis’s appearances, and not even just because it was written and directed by Alejandro Amenábar, who capacity for inserting ambiguity into a story, like in The Others and Vanilla Sky/ Open Your Eyes but because it entertains ideas in its story from a period of time and a cultural series of events that I find fascinating. That of the Satanic Panic that held every Christian in its thrall during the 80s. The time when everything I liked: comics, Dungeons and Dragons, heavy metal, horror movies and horror novels were looked upon as being something that would eventually make me a whore of Satan. Anyway one of the scary things about this period was the psychologists who believed through regressive hypnosis that they could get people to ‘remember’ evil rituals and black masses that they were involved in… I guess using that old adage of ‘the finest trick of the Devil is to persuade you he does not exist’ by Charles Baudelaire being the basis for the idea that evil people can get you involved in these rites and then make you forget what you have done. Which, of course, is ridiculous, and has since been discredited. 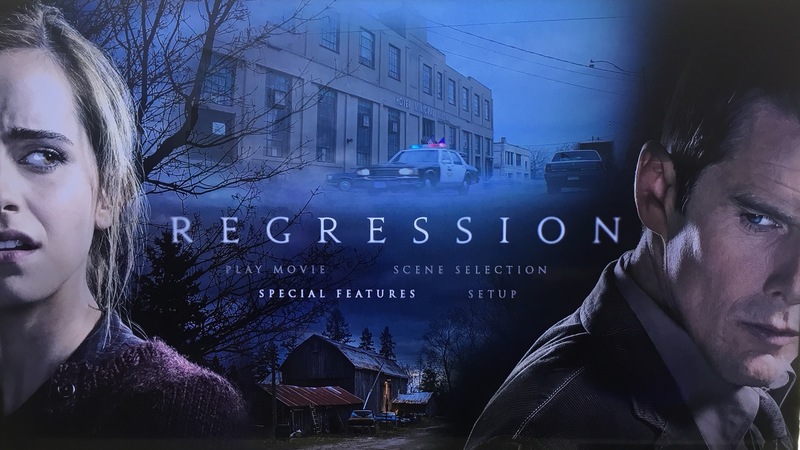 This film, Regression, tells of a small town in 1990 where a man, John Gray (David Dencik) has been accused by his daughter Angela (Watson) of interfering with her. John admits guilt even though he claims he has no memory of it happening, but with using regressive hypnosis performed by Dr Raines (Thewlis), Detective Bruce Kenner (Hawke) becomes convinced there is a satanic cult living in the town, performing unspeakable acts of violence and murder, not only on children like Angela, but on others as well. But is there really, or are conclusions being jumped to without proper investigation? There is no doubt that the film is beautifully shot and every actor performs their role with great conviction. The story has a great sense of doubt and mistrust all through it and will keep you guessing to an end that is ultimately slightly dissatisfying, but appropriate. It seems to tie up all too quickly, and there is really no big crescendo at the finish, so it does leaves one a little flat. 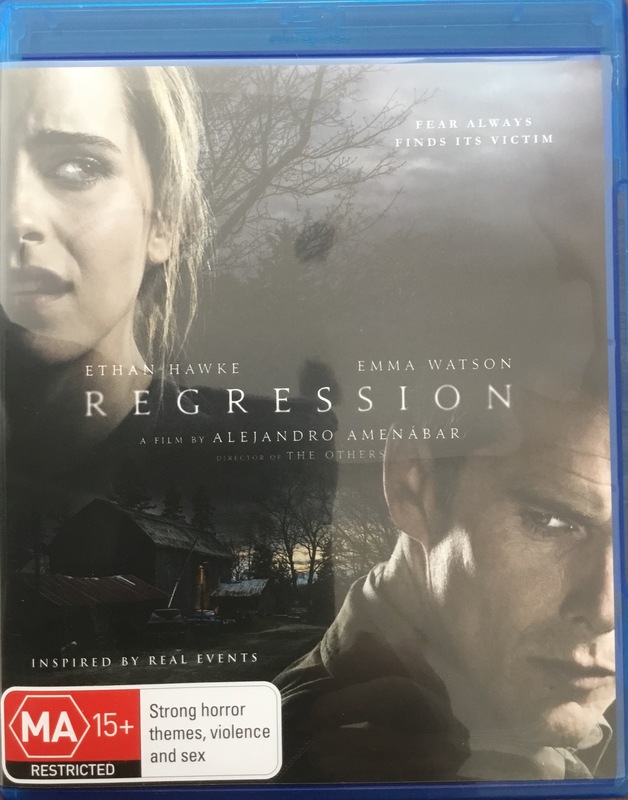 Format: Regression goes for 106 minutes and is presented on this region B Bluray in an immaculate 2.35:1 image with a DTS-HD Master Audio 5.1 soundtrack of matching quality. Extras: There are four short documentaries on this disc’ The Vision of Regression, The Cast of Regression, Bruce’s Obsession and The Complexity of Angela. I’m sure all these featurettes could have been really interesting if they lasted more than 2.5 minutes each. A look at the 80s/ 90s Satanic Panic wouldn’t have gone astray. WISIA: It an OK film, but like a magician revealing his hand, it’s probably not a rewatcher.